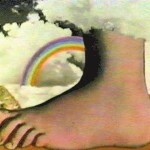 This is a picture of the famous Monty Python foot. The Pythons had a definite idea about what they wanted to do with the series. They were admirers of the work of Peter Cook, Alan Bennett, Jonathan Miller and Dudley Moore on Beyond the Fringe, and had worked on Frost, which was similar in style. They enjoyed Cook and Moore's sketch show Not Only... But Also. One problem the Pythons perceived with these programmes was that though the body of the sketch would be strong, the writers would often struggle to then find a punchline funny enough to end on, and this would detract from the overall sketch quality. They decided that they would simply not bother to "cap" their sketches in the traditional manner, and early episodes of the Flying Circus series make great play of this abandonment of the punchline (one scene has Cleese turn to Idle, as the sketch descends into chaos, and remark that "This is the silliest sketch I've ever been in"—they all resolve not to carry on and simply walk off the set). However, as they began assembling material for the show, the Pythons watched one of their collective heroes, Spike Milligan, recording his groundbreaking series Q5 (1969). Not only was the programme more irreverent and anarchic than any previous television comedy, Milligan would often "give up" on sketches halfway through and wander off set (often muttering "Did I write this?"). It was clear that their new series would now seem less original, and Jones in particular became determined the Pythons should innovate.